Regular maintenance is required to keep your home in top shape, and a home improvement project or two, are typically a common occurrence. Let Sears Handyman Services help take the stress and confusion out of home ownership. We understand life is full of ever-changing priorities, and home repairs and improvements can often fall by the wayside. Our professional technicians can accommodate any schedule and assist with basic to intermediate home repairs. 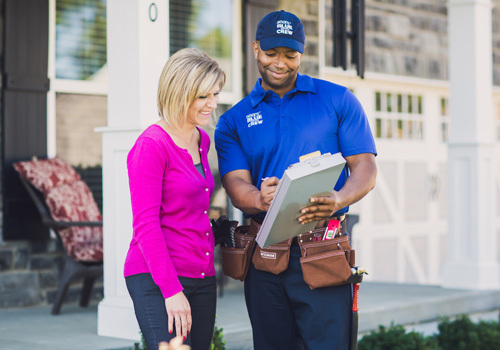 Sears Handyman Services can tackle a variety of projects, freeing you for the more important events in your life. Give us a call at (614) 364-4386. Most homeowners shy away from electrical projects because they simply do not have the knowledge required for most electrical tasks. Sears Handyman Services can complete those projects for you as our technicians are more than capable in handling a wide variety of electrical jobs that do not require a licensed electrician. We can assist with installing ceiling fans, recessed and LED lighting, and repairing basic light fixtures. Contact us today for a thorough listing of what we can do for you. Drywall is typically used in most modern homes and requires basic upkeep from dings, scratches, and holes. Our technicians can help by patching, taping, repairing, and hanging new drywall if that is what the situation requires. No project is too small and with our flexible schedules, we can complete your needs in no time. Contact us today for more information. Through the years, your deck becomes one of the most used areas of your home. Between barbeques and birthday parties, decks can suffer from wood rot and weathering. Sears Handyman Services can repair these issues, including treating it for water damage. Don't have a deck? No problem. We can also build you a deck from scratch that will perfectly fit your home. In addition to decks, fencing can add a certain dynamic to your home. We can install, or repair an existing fence, creating a beautiful, yet functional boundary around your home. We specialize in privacy, picket, and chain link fences. Call us today for a full line of our fencing services. Painting is one of the more tedious parts of home ownership and is often the last thing on your to-do list. Sears Handyman Services is happy to help cross this item of your list. We can assist with removing old wallpaper, painting the interior and exterior of your home, painting hard-to-reach places such as cathedral ceilings, and so much more. Contact us today to get started.